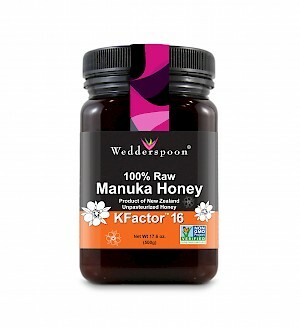 Wedderspoon 100% Raw Manuka Honey KFactor 16 is a HIT! 100% Raw Manuka Honey KFactor 16 is a HIT! My first spoonful reminded me of the honey my grandmother used to give me. This is the best honey, and probably the most expensive, you will ever buy. Creamy, thick, delicious and aromatic with a strong earthy rich flavor; and has the highest viscosity of all honey. Wow! Manuka honey is produced by European honey bees foraging on the manuka tree in New Zealand or Australia. This brand comes from New Zealand. One tablespoon is 64 calories and 16 grams of sugars.